The Focke-Wulf 190 was a single-seat, single engine fighter developed in the late 1930s. Powered by a stronger engine than its famous brother, the Bf109, it got better performance and could lift heavier loads leading to its use in a wide variety of rolls including fighter-bomber. When the Fw190 began flying in 1941, it quickly proved itself superior to the allied planes, and could exceed the Spitfire in all but turn radius, and gave the Germans the advantage in the air through mid 1942 when the Spitfire Mk IX was introduced. 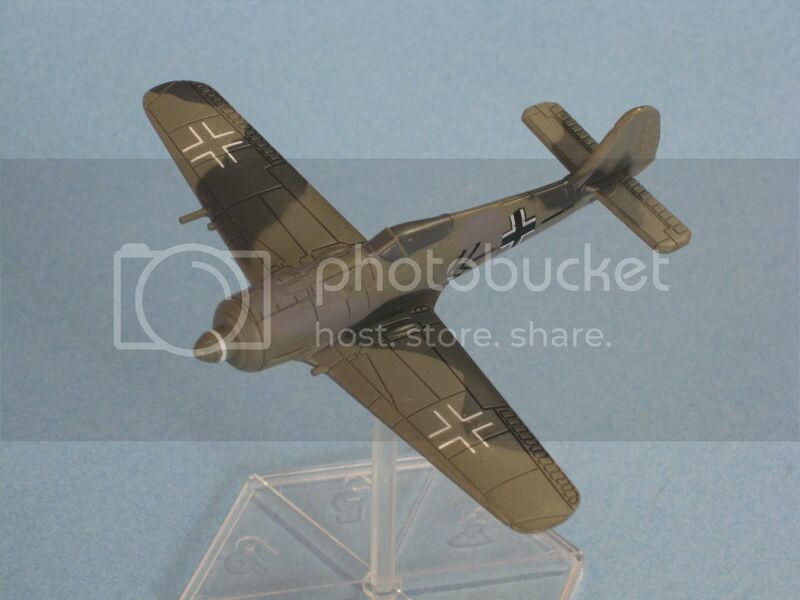 In late 1942, the Fw190 appeared on the Eastern front for the first time. In spite of its success as a fighter, it never entirely replaced the Bf109. The Fw190A, represented in our game, was an early and successful model of the Fw190, though it was generally seen as having high altitude deficiencies (though apparently not enough in-game to warrant negative SAs), though these were largely rectified as the serious moved along toward the D model (which should be very interesting to see done in a later set). The Fw190A Wurger is the most expensive average pilot in Angels 20. What does the Fw190A have in stats? The real question is, “What doesn’t it have?” Both planes have a 9-7-5 attack line, the best attack line in the game. This means that they can afford to take shots from a distance, or close up from a bad angle and still hit their targets, especially if you can add a diving or pilot bonus. They add a 4-7-3 defensive line, the strongest defensive line in the game. You still don’t want to get careless or reckless with them, but they will survive most shots from a bad angle without taking damage, and especially shots with few dice and at a distance. Their maneuver stats total 19 points, also the most of any plane in the game. They turn at a respectable four, which is usually enough to get the job done if you need to turn. They roll impressively well, which coupled with an SA that allows them two difficult maneuvers provided one of them is a Break, tied to the roll stat, makes it very easy to trigger this SA. Breaks, Barrel Rolls and Split-S’s will all come easy for the Fw190A and can even be attempted at high speed with some potential for reasonable success. The Fw190A climbs at a 4, which is quite respectable in the context of the game and often allows it to get the height advantage against many of the allied fighters. The dive value of 5 also allows it to pounce effectively if an enemy dives away from it. A basic speed range of 2-4 and a high speed range of 5-6 gives quite some versatility in zooming around the map and getting into optimal targeting position. Both planes possess the Hard Break SA which allows them to attempt a second difficult maneuver provided one of the maneuvers is a hard break. This is not exactly the easiest maneuver to use. Just don’t forget that a difficult maneuver counts for the hex you are about to move into, which means during your move you can move a couple of times, turn, and then hard break, which can get you turned around if necessary more reliably than a Tight Turn and without losing altitude on a Split-S. Methanol boost allows the Wurger to move straight 1 extra hex at the end of the turn once per game. This is an extremely useful SA for getting one last zone of movement and increasing your attack dice by two. Gaming Evaluation: You can easily play a 100 point game with both Fw190A, since 55 and 44 points respectively adds up to 100 points. You are without an Ace, but with solid defensive lines and superb attack dice, you don’t need an Ace to succeed. Your Veteran Channel Front can pick up bonuses against the potential average pilots that you’ll see. Competitively, this might also be the best build to teach a new player the game, since they’ll have two strong planes that grant the player more indulgences in making mistakes. In the grand scheme of things, the Wurger is probably the more point effective plane, since it is packs the better SA and it is hard to see how the jump to a Veteran pilot is effectively worth 11 points difference. Surprisingly, neither plane’s cost seems off in my gaming experience so far. So perhaps it is a credit to the game that cost discrepancies are less apparent and less influential on the outcome of the average game. In point contests larger than 100, the Wurger definitely becomes a clearer option, since you can always assign a Veteran and defensive fighter like the Bf109F Friedrich to go earlier in the turn while bringing in the superior guns on the Wurger later in your turn. The points saved over a Channel Front may help the build elsewhere. Tactics: Since most Axis planes climb better, it is almost always beneficial to climb with them and aim for an altitude advantage. This will help you avoid giving powerful vertical fighters like the Mustang any diving bonuses. If you’re fighting a turning contest, then the turn value of 4 is still reasonable, but you’ll want to make good use of your roll score since Breaks, Barrel Rolls and Split-Ss can all help you line up for decent shots on those slippery turning planes. With the Fw190, you can afford to take more distant shots, or you can take a close up shot at a bad angle. 9 dice hitting only on a 6 is still going to give you a decent chance of putting damage into an opposing plane, particularly when no other shots present themselves. Other planes may have high attack stats, but only the Fw190 has the maneuvering ability and the speed to set themselves up to take as many shots. Both versions are recommended.